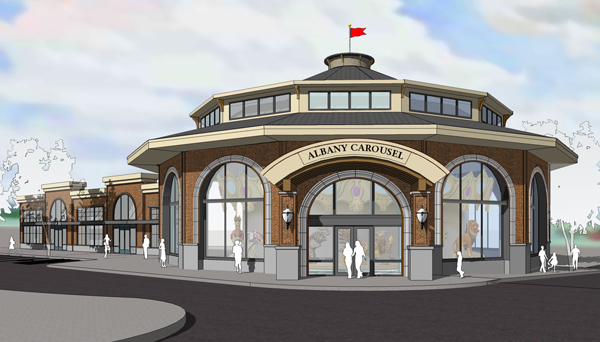 The CARA board hears from Gary Goby, MD, about progress on the Albany Carousel and the thousands of visitors expected to throng downtown when it’s operational. Goby, who retired this month after more than four decades as an Albany physician, appeared before the advisory board of the Central Albany Revitalization Area (CARA) this week. He’s been one of the leaders in the development of the carousel project downtown. In 2007, CARA granted the carousel $300,000 to buy a building at the corner of First and Washington. It now houses the studio where volunteers have been working to carve 52 animals as well as several replacements and a couple of chariots in which carousel riders can sit. The planned carousel building at 503 First Ave. W.
Eventually the building will be torn down and replaced with a much larger structure to hold a donated and rebuilt 1909 Dentzel carousel plus a gift shop and other spaces. In 2011 CARA authorized up to $110,000 to pay for a design of the new building, intended as the western “anchor” of a redeveloped First Avenue. The carousel organization has been working to raise up to $5 million for the building and equipment. Goby says it’s tough going because many other organizations are fundraising too, but he’s confident the money’s there and can be raised. The building fund stands at about $1.4 million, including a challenge gift of up to $1 million, and the organization says on its website the carousel is about four years away from being operational. In 2013, even without the carousel itself, the studio and gift shop averaged about 1,900 visitors a month, Goby told the CARA board. And many times that number are expected when the carousel starts going around in the new building. One idea is to arrange for tour buses to park on the outskirts and shuttle people downtown to walk around, tour the carousel and Albany Regional Museum, and visit downtown restaurants and shops. Goby was not asking CARA for money. But the assumption is that sooner or later a request will be made. This next budget year, 2015, CARA expects to have $3 million on hand for projects including public-private development partnerships. It also expects to have a borrowing capacity of $9.5-$13 million. I fear their optimism is misguided. They are going to tear down the building around the carousel and build a new one while it is “supposedly” operating? I’d like to hear their explanation on how they are going to do that! It would be nice if they could use the existing railroad tracks that go right by the building to bring people downtown instead of tour buses….the tracks aren’t used that much by the railroad and would think it could schedule around tours. Would just need to have parking lots down towards Talking Waters and people could take in both during their visit.